Sometime you need to shut down your Window XP in a hurry especially when you are rushing for an appointment or doing something urgent. But the standard process for a PC to shut down takes time and you need to wait for a while before the Window is shut down. You can get some solutions from Quick ShutDown, a free, fast and easy-to-use shutdown tool that might help you in this. 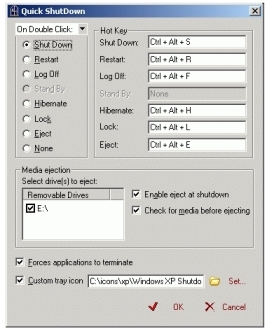 Quick Shutdown makes actions such as shutdown, reboot, hibernate, standby and logoff your computer with one mouse click. When you are running QuickShutDown, an accurate miniature icon appears on the taskbar on the end opposite the “Start” button. You can choose to click or double click it with the left mouse button, and it shutdowns or reboots your computer. This tiny, memory resident tool allows you to configure key combinations that shut down and restart your PC. Read out more from Quick ShutDown.